I was recently sent a home medication lock box from Lock Med to keep in my house to hold any medication. The box is a sturdy metal box with a combination and a key. It would be nearly impossible for a child to get into it without the key or combination. It’s perfect to travel with also. The large box is a secure commercial size container to store medications. Double Combination Lock offers ability to set two different lock combinations. Can hold approximately up to 36 prescription bottles. These boxes are perfect to give to grandparents for their medication so you also have peace of mind when your children are visiting. I know leaving pills around is a big issue with grandparents. I used to have to check around the house for medication laying around for the kids to get to before I left. It’s a huge anxiety because even if you know that you don’t leave anything laying around you don’t know about your parents or anyone else that is watching them. That is why this is a great thing to give to grandparents or anyone else that watches your children. There are several sizes and styles to choose from and the prices are very reasonable. 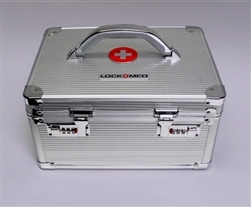 Check out lockmed.com.The lock boxes are a good gift.